Have your monthly projects managed automatically by Costlocker. Just set up a RECURRING project and define its basic settings. RECURRING projects are a handy solution for fee-based and internal projects. Costlocker will save you the hassle of creating projects manually every month and do it automatically instead. It won’t happen that people will track into the wrong month either – when a project for the next month is created, the previous one will automatically get closed, so that people can’t see it, track into it or edit their timesheets anymore. Of course, it’s also possible to create one-off STANDARD projects with a clearly defined start and end – such as website or app projects. 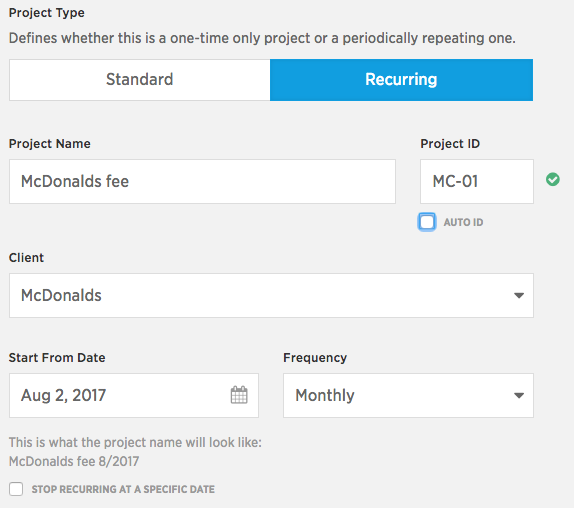 Don’t include any timeframes in the name, such as McDonalds fee – September. As soon as the project is created, the time designation will automatically be appended to the project name, e.g. McDonalds fee 9/2017. Now select the date when the first project starts and choose how often it is supposed to be duplicated. Duplication end: In case the project is agreed to run for a limited number of months, you can set up the end date here. Scheduling the project start: It’s possible to schedule a fee-based project ahead of time – just set the start date into the future, and it won’t be displayed in people’s time tracking until then. Pro tip: If you invoice your clients for hosting and domains once a year, create an annually recurring project. We’ll remind you to invoice once a year. Keep it open = After the project for the new month is created, everyone will retain access to the previous month’s project. This allows people track time or edit their timesheets retrospectively. Lock it = As soon as the new month’s project is created, the old one will immediately disappear from people’s time tracking. They won’t be allowed to edit their timesheets either. This is the most commonly used option for fee-based projects, as people can’t mistakenly track time in the previous month. Finish automatically = By the 1st day of the new month, the previous month’s project will automatically get finished and moved from running projects to finished projects. If the project has a defined budget, this will be flagged as invoiced on the date of the 1st day of the month. That’s why this option is used mostly with internal projects, where there are typically no budgets and the only thing left to do with the project is to close it. 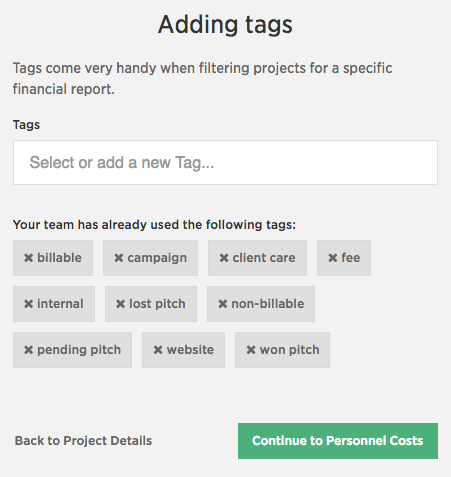 Tagging projects is critical for reporting, as all reports include tag-based filters. If you ever get curious how much you work on tenders for example (and how much time and money has it cost you so far), you can filter the projects out using the Running tenders tag. 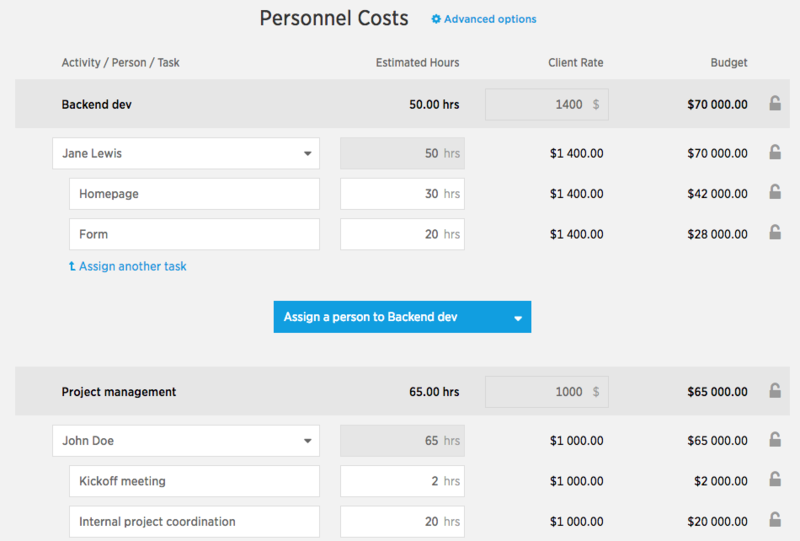 In this step, you’ll define time estimates for individual people and their tasks, as well as the client rates for each activity or role. Define the activities or roles on the project, i.e. project management, graphic design and analysis, or senior designer, art director and PPC specialist. There can be different rates assigned to different activities that you invoice. Costlocker will remember these rates and next time when you’re creating a cost estimate, it’ll automatically pre-fill these fields for you. Add people to work on the project under every defined activity or role. Read how to add new people to projects if you’re not sure how to do that. It is best to assign concrete tasks to everyone, so they know what to track and don’t have to enter any notes into their timesheets. Next, enter time estimates for each activity or role that your client has approved. If you arrange so with the client, these estimates can be extended at any point during the project. Nevertheless, the cost estimate should always reflect what your client has approved. Note: It’s possible to skip this step and define the project budget using external expenses only. To do so, just click the Save and Continue button. Any project expenses outside your company go here. Simply enter the buying price into the Purchased field, and the selling price into the Invoiced field. Project supervisors are people allowed to edit the project – these can include account managers, project managers, etc. You can add anyone by entering their names, except people with Employee roles only – their rights don’t allow them to access project information. 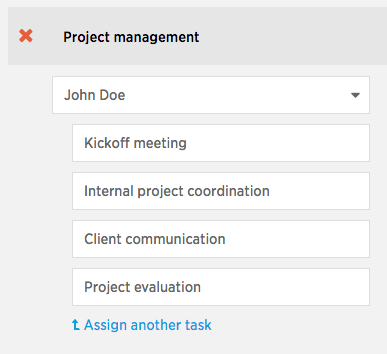 Only Administrators or Managers can be added as project supervisors. Note: It’s not necessary to add any Admins as project supervisors, because their access rights include project editing by definition. 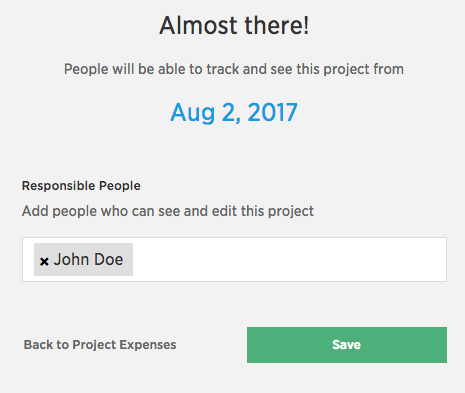 Pro tip: Add your clients as project supervisors too! ALL SET! We’ve just created our first project! 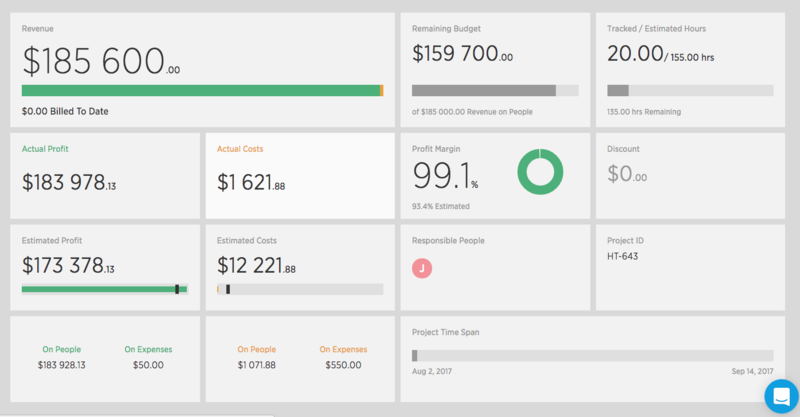 Now it’s time to see all the different financial metrics available on the project page.